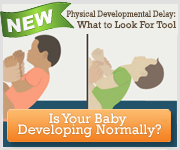 Healthy Children > Ages & Stages > Baby > Infant Vision Development: What Can Babies See? ​What can my baby see during the first year of life? A baby's vision develops quickly during the first year of life. Newborns: Can see large shapes and faces, as well as bright colors. By 3 to 4 months: Most babies can focus on a variety of smaller objects and tell the difference between colors (especially red and green). By 4 months: A baby's eyes should be working together. 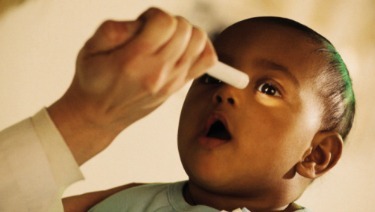 This is when babies begin to develop depth perception (binocular vision). By 12 months: A child's vision reaches normal adult levels while he continues to learn about and understand what he sees. Keep in mind that each child's vision develops at his or her own rate, but the overall pattern of development is the same. Because a baby's vision develops quickly during the first year of life, your child's doctor will check your baby's eyes at each well-child visit. Even after the first year, regular eye exams by your child's doctor are important to identify problems that may arise later in childhood.